After attending my friend’s wedding, we had several more days on Oahu wandering about and exploring. However, the splendid, sunny weather that had greeted us upon arrival turned primarily into… rain. Now, several tourism guides on the internet will tell you that it doesn’t really “rain” per se in Honolulu, just “drizzle and trickle”… but if that’s the case, we got almost 8” of “drizzle and trickle” our last few days there. So that left us with a lot of non-beach activities to do, and one of those was taking a food tour. In our case, we went with Hawaii Food Tours, who offer several highly-rated tours on Oahu. In our case, we opted for their “Hole-in-the-wall” tour focusing on “local” food for the Honolulu scene. So our first stop with them was in Chinatown Cultural Center at the edge of Chinatown, in a place called Royal Kitchen. 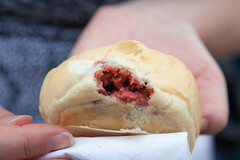 While Royal Kitchen does serve up a lot of standard Hawaiian fare like plate lunches and saimin, what they are really known for is manapua, the Hawaiian version of char siu bao, those Chinese soft buns filled with meat. As I mentioned in my previous review of 7-Eleven, those little buns are available almost everywhere on the island, in a variety of flavors. But Royal Kitchen stands out, since most places steam their manapua, while Royal Kitchen bakes theirs. Walking into Royal Kitchen, it’s basically just one service counter, but they are running a land office business (am I allowed to use that term for a place on an island?) with people ordering up baked manapua (with 10 different varieties), pork hash, ma tai su, half moons, and other dim sum, along with the occasional plate lunch or saimin. But supposedly the real action here is the baked manapua, so our host Bill with the food tour took orders from everyone, and soon came out with a box full of manapua of several variety (all stamped with edible red ink to indicate the variety, with a handy legend stamped on the box). I had ordered a kalua pig manapua (having already had several char siu ones around the island), and my first comment was that this was a substantial manapua, a bit denser than many of the steamed ones I have. Biting into it, it was generously stuffed with very tasty shredded kalua pig, with a nice, sweet and slightly smoky flavor. Bun-wise, this was about a traditional steamed Chinese bao bun, and a really good Western-style dinner roll. Overall, I was pleased with this manupua, and agree that Royal Kitchen did one of the better ones we had on the island. I also got to sample two other manapua: Carol’s classic char siu one, which was also really flavorful and generously filled, with a very rich, sweet, and tangy char siu. 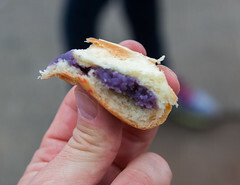 The other sample was of “okinawan sweet potato”, which has both a rich, yammy flavor, and the most interesting purple color. But both were very pleasing. I’ll have to say, Royal Kitchen was a great place to start a food tour. It’s a nice hole-in-the-wall joint serving up a rare but pleasant variation of the standard manapua, doing so with a great amount of flavor and an excellent texture of the bun. 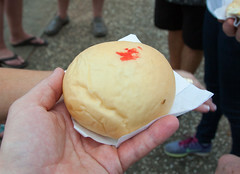 And at $1.30 a manapua, the price is pretty good as well. Carol’s employer has some pretty cool employee benefits programs. One of them tries to address the fact that the Upper Valley area of NH/VT isn’t exactly the most happening place, and offer a lot of programs for both local recreation, as well as travel. As part of this program, they offer up cheap trip (that’s how we went on last month’s trip to New York City for Grimaldi’s, for example). This month, they offered up a cheap day trip to Montreal, so at 5am, we hopped onto a bus at Dartmouth, and by 10:30 we were at Dorchester Square in downtown Montreal. After breakfast and some light shopping, we decided to head up to one of my favorite parts of town (the “Plateau”, where there are a lot of cool shops and restaurants on Boulevard St Laurent and Rue St Denis). To get up there, we availed ourselves of Montreal’s most excellent Bixi bike rental system. After an hour of riding Bixi bikes around Mont Royal park and the plateau, we decided a small lunch was in order. We ended up going to a place that’s been on my hit list for a while: Patati Patata, a small little diner featuring sliders and poutine.